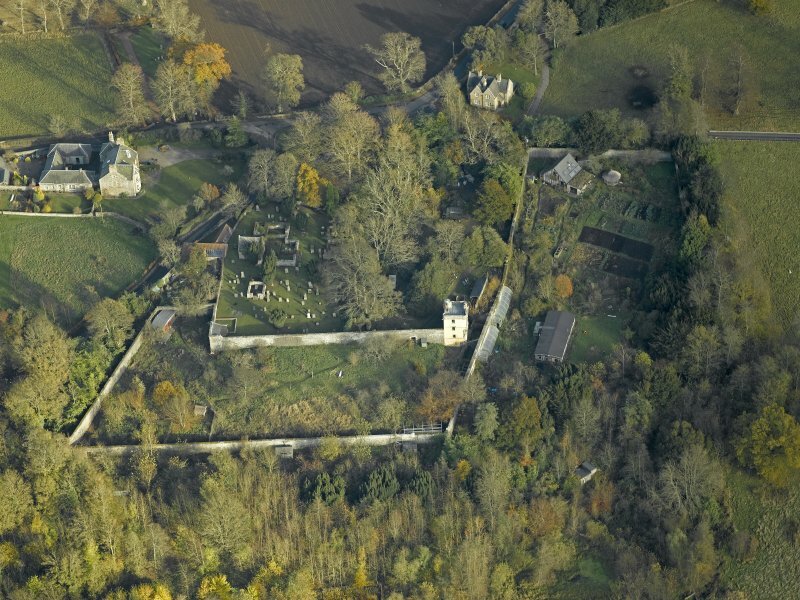 Oblique aerial view centred on the tower and burial ground, taken from the S.
Oblique aerial view centred on the tower and remains of the palace with the walled gardens adjacent, taken from the WSW. 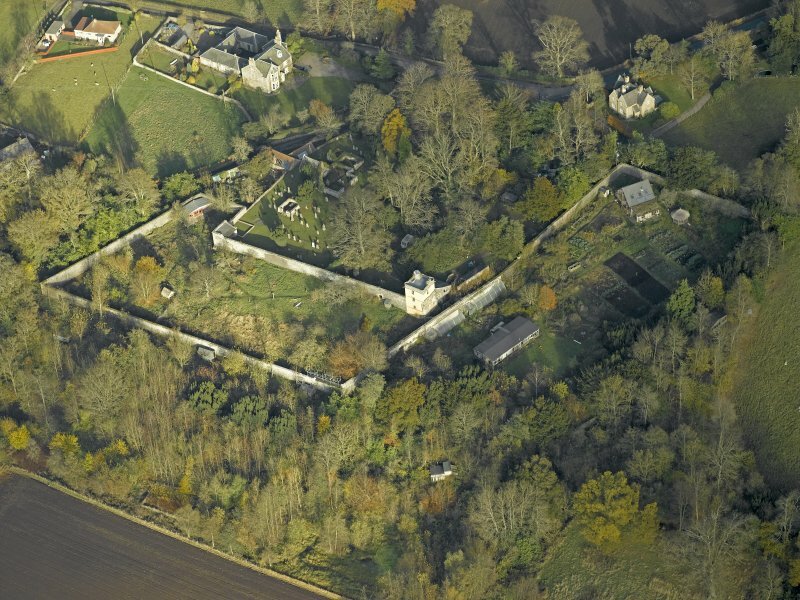 Oblique aerial view centred on the tower and remains of the palace with the walled gardens adjacent, taken from the NE. Monimail Tower, view from north west. 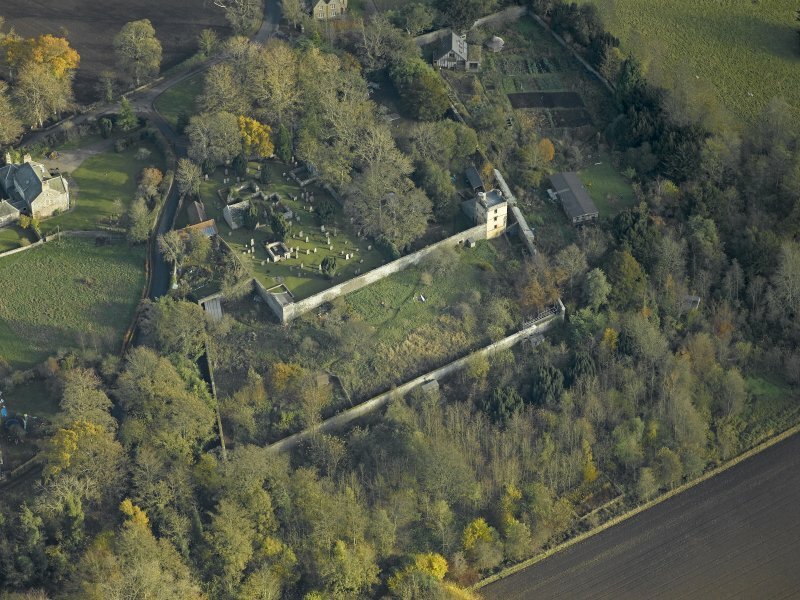 Oblique aerial view centred on the tower and burial ground, taken from the SW.
Oblique aerial view centred on the tower and burial ground, taken from the W.
General oblique aerial view centred on the tower, the old parish church and burial ground, taken from the SE. 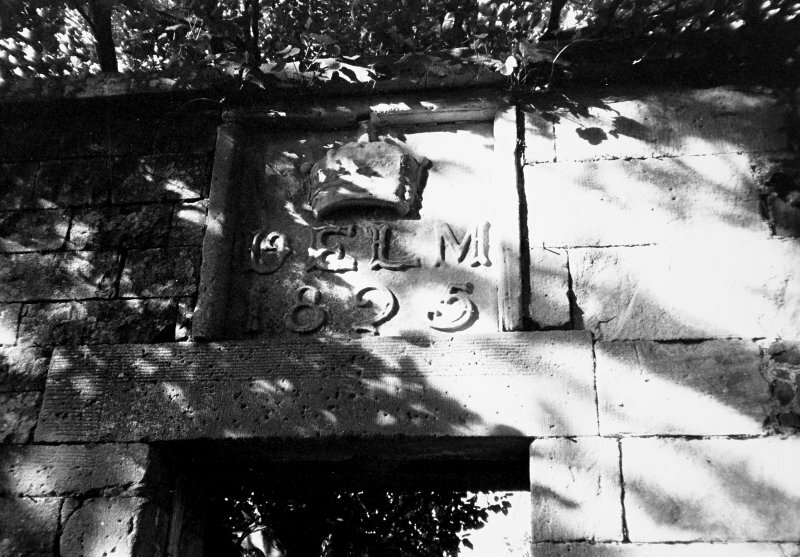 (Remains of Old Palace of Monimail). Monimail Tower. 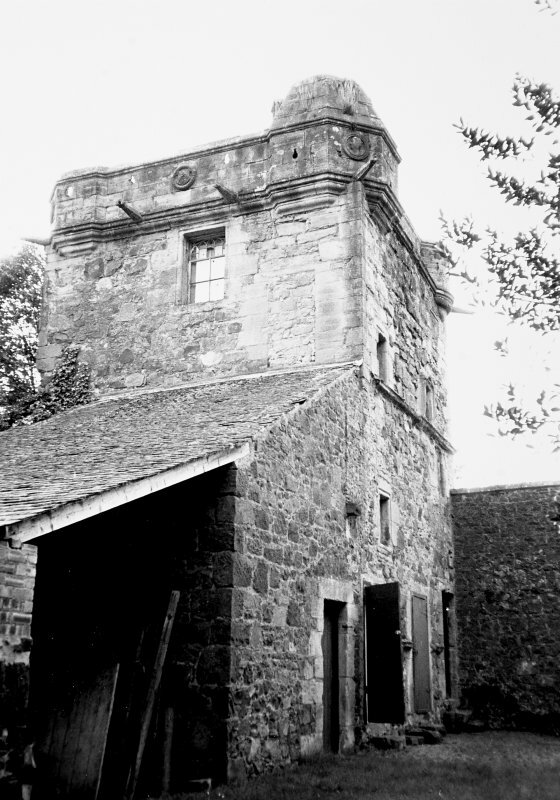 This small tower is all that remains of the former palace of the Archbishops of St Andrews. That part which has disappeared, seems to have been three storeys high, and abutted against the E and S faces of the tower, which is almost square on plan and four storeys high. Cardinal Beaton (1539-46) is said to have built this tower, and the lower part may be his work, but the upper levels are of later construction and post-Reformation alteration, date 1578. 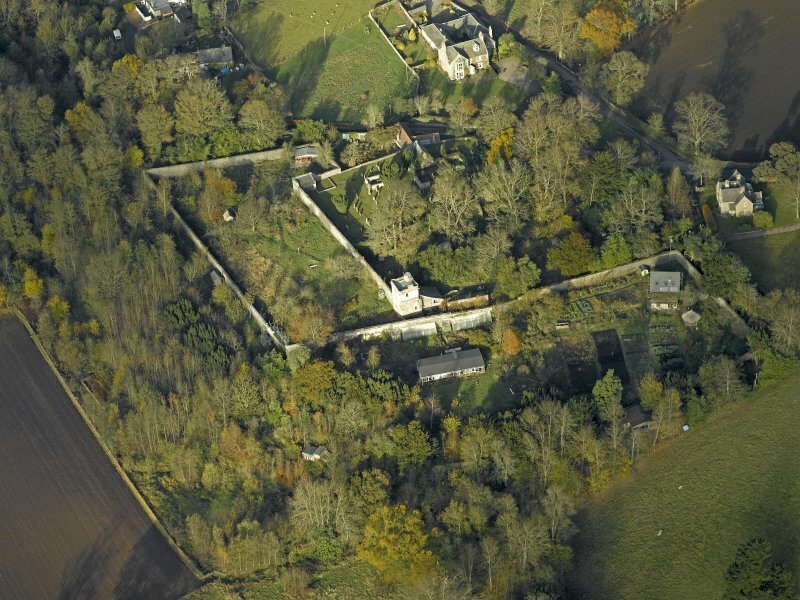 There was an episcopal residence here reputedly as early as 1300, however. After the Reformation, the lands of the palace passed to the Balfours, and thence to the Melvilles. 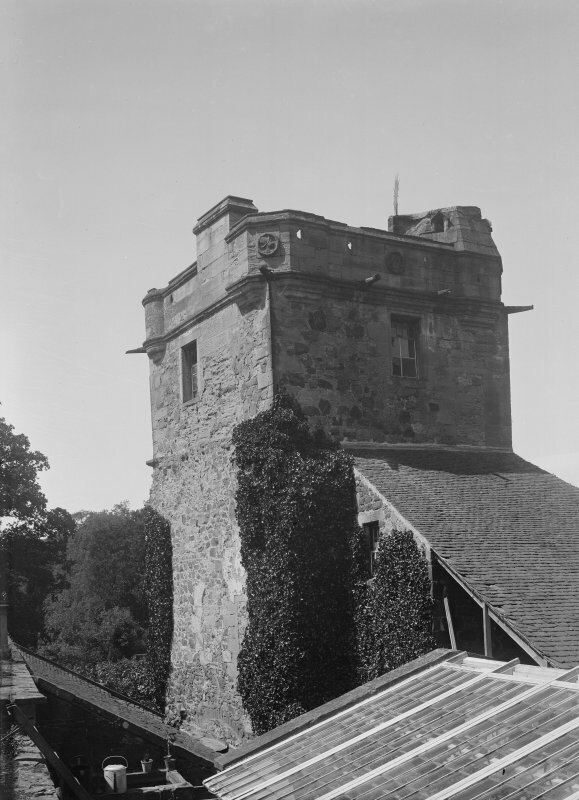 RCAHMS 1933, visited 1925; N Tranter 1962-70. Monimail Tower (name confirmed) is as described and planned. At NO 2983 1411 is a ruinous rubble built vaulted chamber with an oval horizontal gun-loop in the south wall, probably a fragment of the former palace. Visited by OS (D S) 31 October 1956 and (W D J) 12 May 1970. Memorandum of sums received by the laird of Pitcullo and James Balfour, prior of Charterhouse, from Sir Robert Melville or Murdocairny for Palace of Monimail. Note of the progress of the house from the Bishopric of St Andrews. 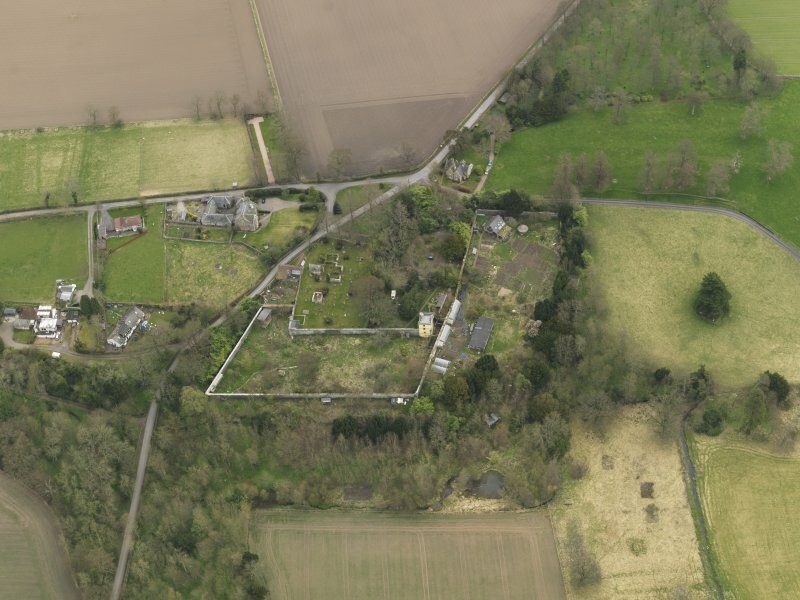 A Resistivity Survey of the Site of the Episcopal Palace at Monimail, Fife, by S J Dockrill and J M Bond, University of Bradford, 1982. 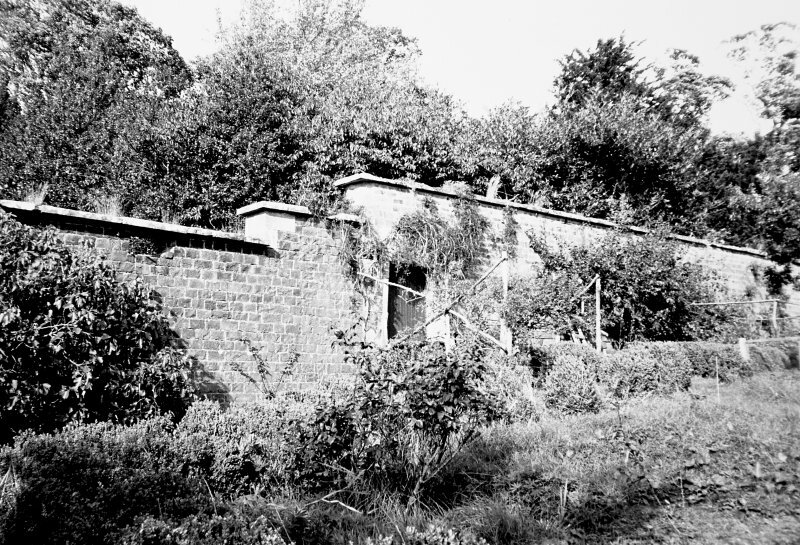 Excavations in the Walled Garden, 1983, by Kirkdale Archaeology. 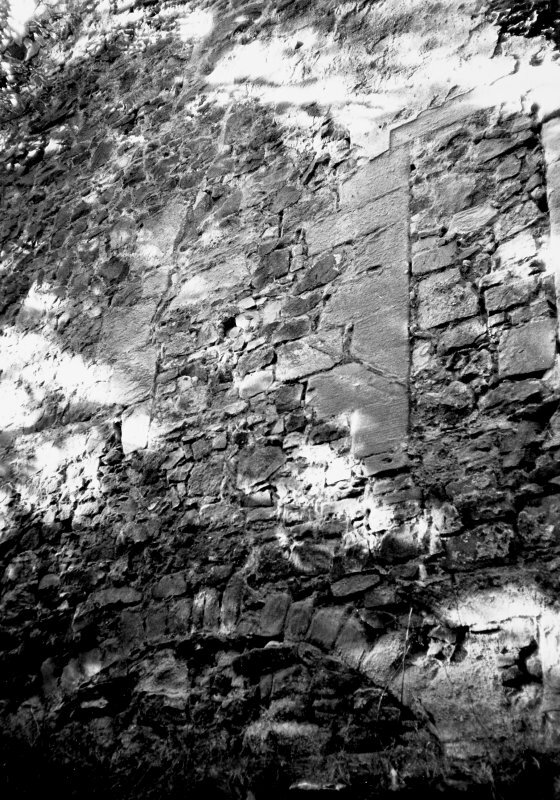 Excavations (1987) at Monimail Tower, Monimail, Fife, by Dr E Grant. NO 298 142. 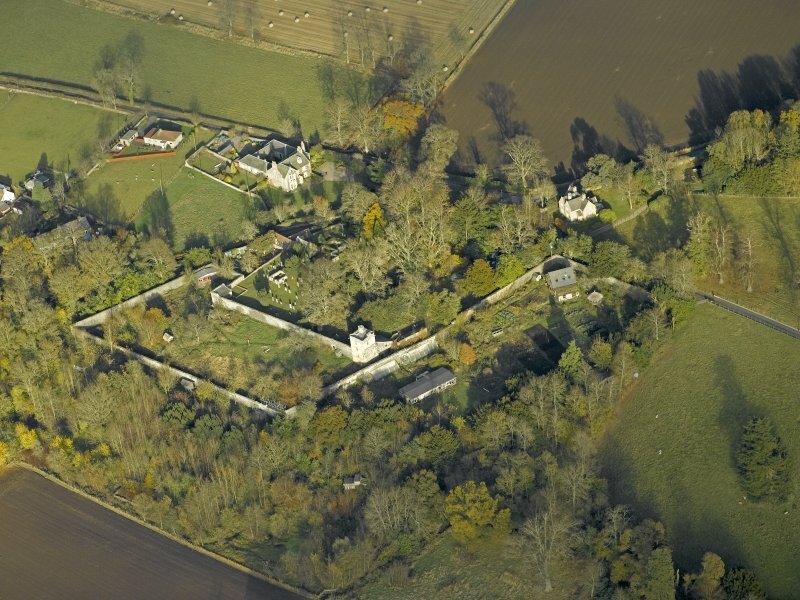 An evaluation was conducted of the area to the immediate N and NW of Monimail Castle, in accordance with a specification produced by the Regional Archaeologist for Fife Region. 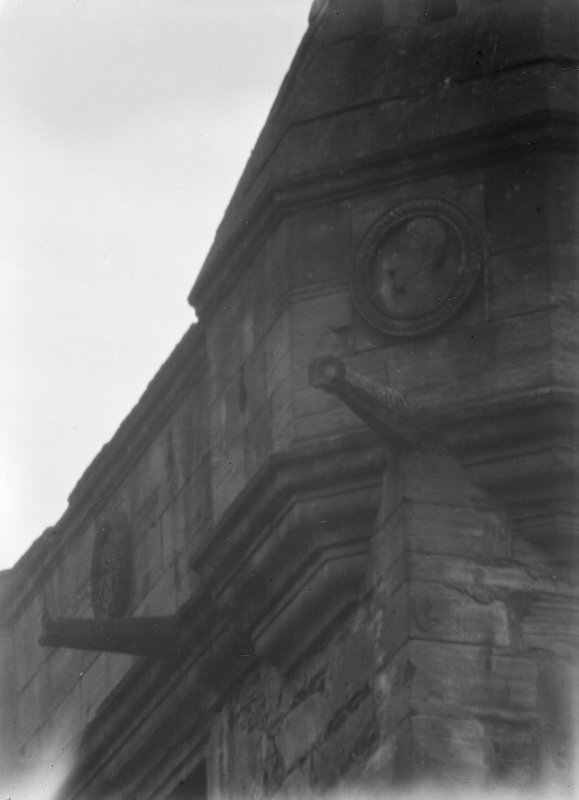 The upper part of the structure is dated to 1578, although the lower part may be earlier. 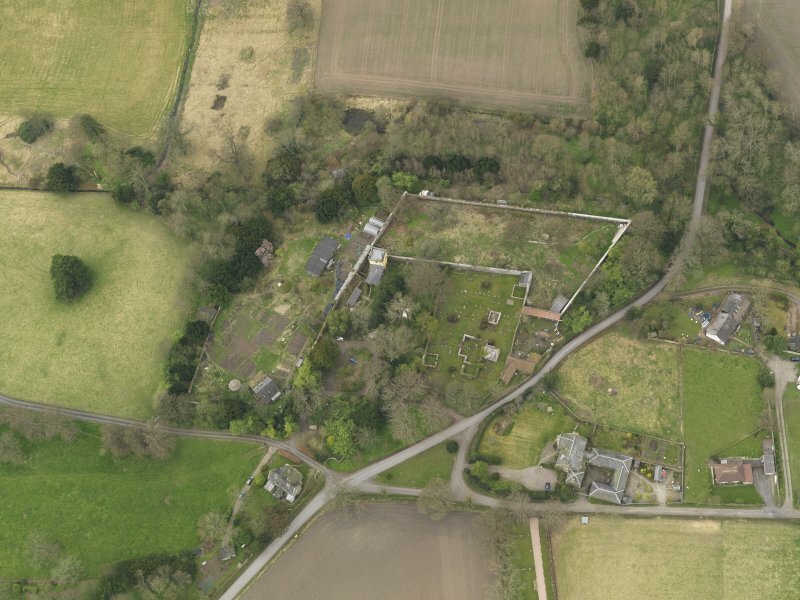 A previously-unrecorded probable corner tower (NO 2983 1412) was discovered, mostly buried in a substantial depth of topsoil and located about 20m to the NW of the tower house. The remains appear to have been exposed recently. 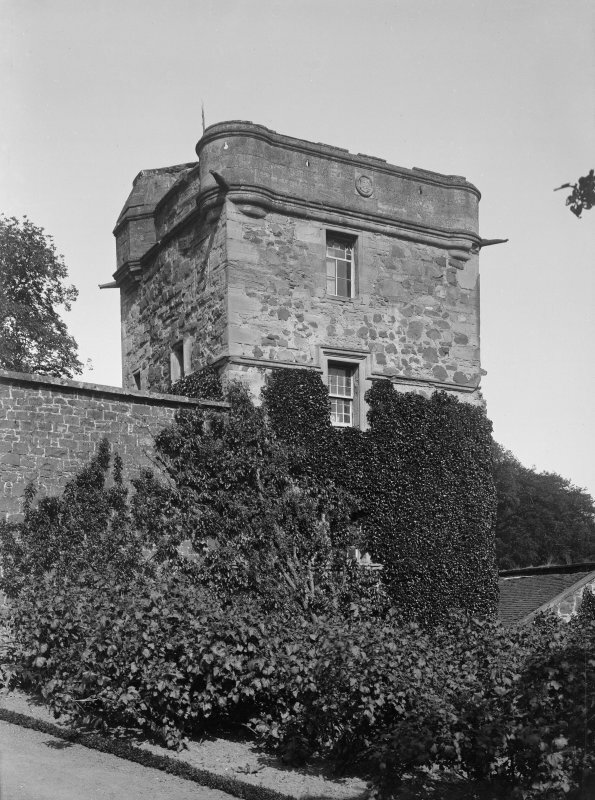 The structure has a gun-loop clearly visible on its SE side, facing towards the tower-house. 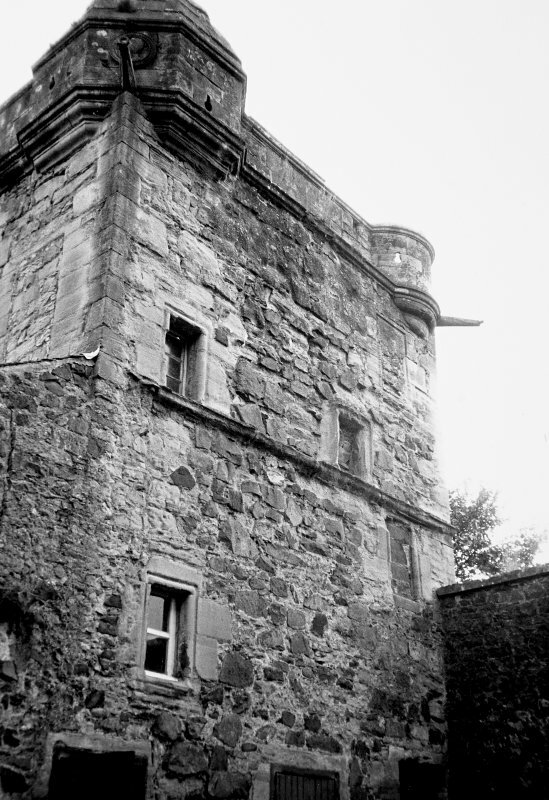 The remains of a joining wall are clearly visible on the S side of the probable corner tower, suggesting that a curtain wall joined the corner tower with the NE of the tower house, with the gun-loop positioned to provide enfilading fire. Resistivity survey conducted over an area of about 1250 sq m was unsuccessful in detecting archaeological remains, mainly due to the excessive depth of topsoil (over 1.5m in most places). Small trial trenches placed on the basis of extant structural remains produced evidence for possible wall foundations running SW from the corner tower. A trial trench excavated across the proposed line of the wall running between the tower house and corner tower produced no evidence for its existence. NO 2984 1409 An archaeological watching brief was maintained on three areas surrounding the 16th-century tower (NMRS NO 21 SE 13) as part of a project of restoration works. Work in the area of the orchard lay close to the W elevation of the tower and revealed the base of a window and door to the underground ice house. No features were found in the excavation area, being limited to garden soil. Historical data has shown that the whole orchard is made-up ground of early 19th-century date. Work on the consolidation of the tower stub to the N of the tower revealed the remains of a bread oven of 2.5m diameter. No dateable finds were recovered but a post-medieval date is likely. The oven had been partly cut by two archaeological excavations in 1987 and 1993 but not wholly exposed and identified as such. The adjacent churchyard boundary wall was identified as utilising part of a running wall from the NW corner of the tower. Excavation of the gas and water service pipe trenches was mainly limited to garden soil, though a small section of the walling running from the tower to the tower stub was revealed, though this area had been excavated previously in 1987. A full report has been lodged with Fife SMR and the NMRS. Sponsor:	Monimail Tower Preservation Trust. Monimail Tower: geophysical survey and trial excavation, by T Neighbour, 2001.